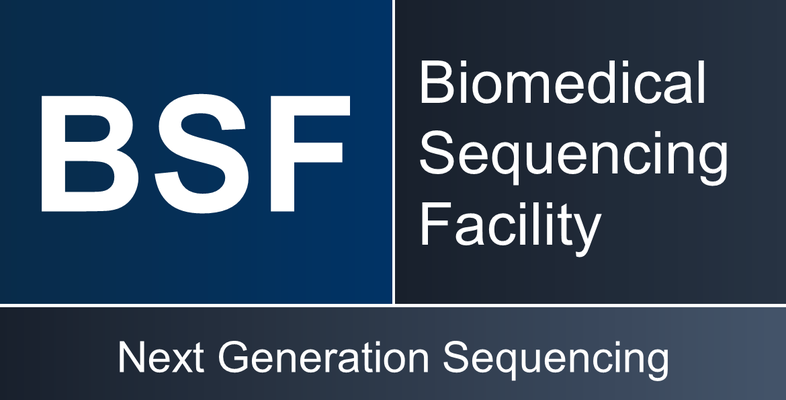 Which services does the Biomedical Sequencing Facility (BSF) offer? The Biomedical Sequencing Facility offers a broad range of NGS-related services, including library preparation (genome, epigenome, transcriptome, single-cell sequencing, etc. ), sequencing of custom libraries (Illumina NovaSeq/HiSeq 4000/NextSeq/MiSeq and Oxford Nanopore platforms), and bioinformatic data processing. A detailed list of prices and services is available for download / available on request. Who can use the services of the BSF? 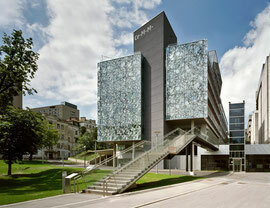 The Biomedical Sequencing Facility (BSF) is an academic core facility that serves researchers and clinicians in Vienna, in Austria, and internationally. The majority of projects involve the two partner institutions – the CeMM Research Center for Molecular Medicine of the Austrian Academy of Sciences and the Medical University of Vienna as well as the affiliated clinics, institutes, and laboratories. In addition, the BSF serves academic institutions in Austria and internationally as well as a small number of biotechnology and pharma companies, with an emphasis on protocols that are a special expertise of the BSF not widely available (including epigenome mapping and single-cell sequencing protocols). How can I obtain a quote for a project or grant application? Please write an e-mail to bsf@cemm.oeaw.ac.at and try to give us as much information as you can about your planned sequencing project. We will contact you as soon as possible to discuss the project in more detail (if needed) and prepare a quote according to your project specifications. We encourage you to contact us early on in your experimental planning or grant writing process. How much DNA or RNA do I have to supply for a specific protocol? What are the quality requirements? The sample requirements vary between protocols. Please contact us at bsf@cemm.oeaw.ac.at to obtain detailed instructions for the protocol of interest. Should I pool my libraries when submitting custom libraries for sequencing? We prefer to receive ready-to-sequence library pools. How should I ship my samples? Please see the paragraph on "Sample Delivery" in the section "Sample Submission" for a detailed description. Most importantly, please make sure to send the samples with an ample supply of dry ice and to avoid unnecessary delays. How do I annotate my samples? Please fill out a sample annotation sheet with the tabs "Summary" and "Samples", "Libraries" and "Sequencing Request" for ready-to-sequence pools. In case you send RNA or DNA for library preparation the tabs “Libraries” and “Sequencing Request” will be completed by the BSF staff. Please send the sample annotation sheet together with a signed copy of the sequencing authorization form to bsf@cemm.oeaw.ac.at. We require this information to spot mistakes at an early stage in the process. Therefore, we cannot process samples without proper documentation. Generally, sample names should be simple with up to 8 alpha-numeric characters and not contain any special characters except underscores. Avoid using common names such as A, B, C, etc. or 1, 2, 3, etc. Please remember that sample names will be used for file names, appear in gene lists and plots so the shorter and more meaningful they are the better. What happens once my sample has been submitted? We will perform quality control, i.e. concentration measurements and assessment of fragment size / sample integrity. Samples that have passed quality control are scheduled for library preparation, and libraries that have passed quality control are scheduled or sequencing. The sequencing involves three main steps: cluster generation, next generation sequencing, and bioinformatic data processing. You will receive an e-mail once the process has been completed and the data is available for download. How much will a requested sequencing service cost? For academic collaboration projects, the Biomedical Sequencing Facility charges only direct costs (reagents, personnel time), while other costs (assay development, infrastructure, overheads) are carried by the host institution. A detailed list of prices and services for academic collaboration projects is available for download / available on request. The listed prices do not include VAT, which will be added to the final bill as required by law. Fee-for-service and commercial prices are based on full costs and available on request. Please contact us at bsf@cemm.oeaw.ac.at to request a quote for your project. How long will it take to receive data from my submitted samples? We seek to maximize data quality while controlling cost and ensuring rapid turn-around time. In general, queuing follows “first come, first serve policy”, but we also need to coordinate sequencing runs for cost-effective use of reagents and machine time. For example, the requirement of the HiSeq 3000/4000 system to sequence 8 libraries per flow cell requires coordination between several sample providers, which is not always predictable. Therefore, in most cases we can give you an estimate but not a specific date for the data delivery. Early notice about upcoming requests usually facilitates scheduling and tends to decrease turn-around time. Furthermore, for urgent samples it is possible to avoid scheduling delays by sequencing these samples separately, but this tends to come at a higher cost because the reagent costs are higher. In general, clear communication of hard time constraints (e.g. paper resubmissions) and the trade-off between speed and cost help us plan and schedule the sequencing in the most suitable and efficient way. How and in which format do I receive my data? After your submitted samples have been processed and sequenced, you will receive by e-mail a login name, a password, and a link to the BSF data download portal, which provides the raw sequencing data as unaligned BAM files. If further bioinformatic data processing has been requested, we will separately provide you with aligned BAM files as well as more detailed data analysis reports. Why does the BSF provide raw data in unaligned BAM format? In contrast to the FASTQ format, the BAM format utilises an unambiguous schema to encode base quality scores and it allows for modelling of meta data. Our meta data annotation includes instrument information, run dates, the sequence of programs that were run for raw data production and conversion, as well as version numbers and even complete command lines. The BAM format also permits annotation of adapter sequence clipping or unique molecular identifiers (UMIs) in a standardised manner. Amongst many tools for the conversion of (unaligned) BAM into FastQ format, the Picard tools SamToFastq algorithm would be an option that works well. How long are the sequencing data of my samples stored? Your sequencing data will be accessible via the BSF data download portal for one year. Afterwards, we store the raw sequencing data in an offline backup. While these backups are stored in the long term, no formal guarantees can be made that the data will be restorable after an extended period of time. How many reads will I receive? According to the (conservative) Illumina specifications, one HiSeq 3000/4000 lane has an expected yield of >310 million reads. The largest NovaSeq flow cells can provide up to 8-10 billion reads, NextSeq flow cells based on configuration 130-400 million reads and MiSeq flow cells based on configuration 1-25 million reads. However, when sample quality is low, these values can be lower. Is there a difference between HiSeq 3000 and 4000? The HiSeq 3000 and 4000 are in principle the same instrument, with the only difference that the HiSeq 4000 can accommodate two flow cells at the same time, while the HiSeq 3000 can accommodate only one. We operate one HiSeq 3000 and one HiSeq 4000 machine, and in our experience it does not make any difference on which machine a sample has been sequenced. How do I acknowledge the work done by the BSF? For all publications arising from collaborative academic sequencing, the BSF should be acknowledged through a sentence in the Acknowledgements section and/or through co-authorship, depending on the scope and scale of the BSF’s contribution. Please inform us when you are preparing a manuscript that falls into this category, and we are happy to provide relevant text for the Methods section and assist with data upload into the relevant public repositories.